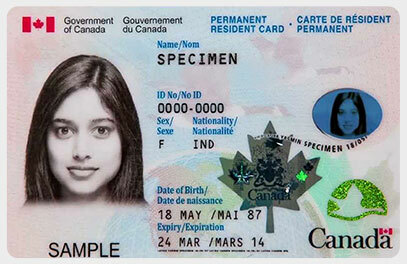 Prepare and complete your Application for a Permanent Resident Card today! Complete your application quickly and correctly with our step-by-step guidance that leads you through each question. Immigration Expert Review now available with your application package. Form IMM 5444E is used by individuals with permanent resident status in Canada, who are applying for their first Permanent Resident Card or for a renewal or replacement of a Permanent Resident Card. The Permanent Resident Card is the official document that provides secure proof of Permanent Resident status. Generally, individuals are eligible for a Permanent Resident Card only if they have entered Canada through the immigration process and have been granted permanent resident status. If you become a Canadian citizen, a Permanent Resident Card is not required. you are not a Canadian citizen or registered Indian under the Indian Act. be a permanent resident of Canada. not be under an effective removal order. Complete your application quickly and correctly with our step-by-step guidance that leads you through each question. Pay the government filing fee online. Gather your supporting documents and submit them with your application to IRCC (formerly known as CIC). Upon approval of your application, report to the local IRCC (formerly known as CIC) office to collect your card.